The Scottish Government’s Rural and Environment Science and Analytical Services (RESAS) division has an exciting new programme of research to address major policy issues, carried out by leading teams of scientists across a range of Main Research Providers (MRPs). Inform by delivering evidence on major policy issues such as climate change, land use and food security. Contribute to the ‘Wealthier’, ‘Healthier’ and ‘Greener’ objectives of the Scottish Government to help deliver sustainable economic growth. Continue to build and strengthen a global reputation for delivery of integrated, multidisciplinary, policy focussed research to the public. Delivery of evidence based information on these topics is vitally important to Scotland’s future prosperity and wellbeing. The Environmental Change Programme investigates and informs policy on how we can respond to anticipated issues of global change, such as climate fluctuations and shifts in demands on valuable land resources. It is vital that we are able to deal with these future eventualities using evidence, while also considering the uncertainty of environmental change. Read more about the four themes in the Environmental Change Programme below. The Food, Land and People Programme links food production right across the food chain to economic output, health and environmental outcomes. The programme interacts with the rural industries, the food sector and rural communities to build a sustainable future where economic and social activity is balanced with protecting and nurturing Scotland's valuable natural assets, including our food and land. Each Programme is structured into interconnected research Themes. Each Theme requires collaboration between scientists within the MRPs and between Themes across the programme, to bring novel research perspectives and holistic information to key policy areas. Each Theme and Programme has knowledge transfer and exchange embedded within its core objectives, aiming not only to inform but to be informed by policy, agriculture, industry, the voluntary sector and community stakeholders in shaping the development and delivery of internationally recognised research to national priorities. 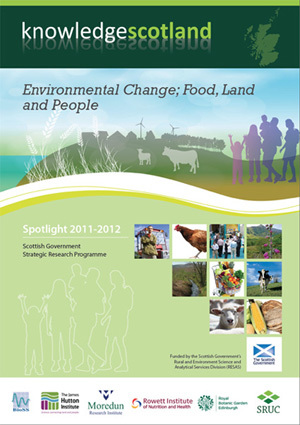 Read more about the four themes in the Food, Land and People Programme below. The Environmental Change Programme is aligned with the UK intergovernmental research partnership, Living with Environmental Change led by the Natural Environment Research Council (NERC). The programme responds to the Coordinated Agenda for Marine, Environment and Rural Affairs Science (CAMERAS) priority of Local Responses to Global Change. The Food, Land and People Programme is aligned with the UK Global Food Security programme led by the Biotechnology and Biological Sciences Research Council (BBSRC) and responds to the CAMERAS priority of Optimising the Use of Natural Assets.